In Part 2 of The Journey Down Chapter 2, the M.S. Biko crew and the Bwana gang arrive at Port Artue. Bwana and Kito are arrested and put in prison by police Chief Barlow immediately, and Lina has been taken away. 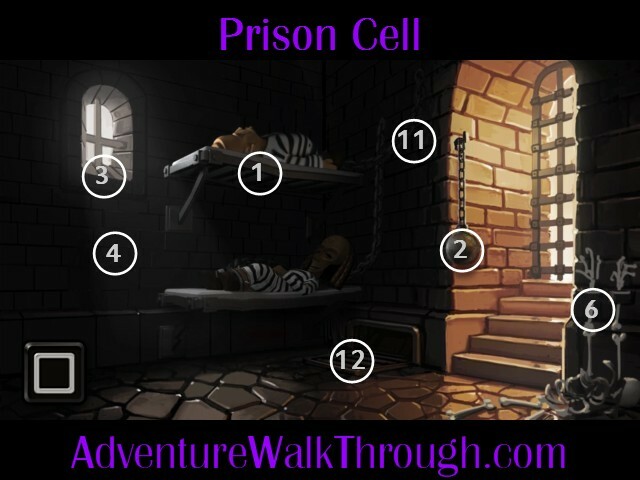 Your goal is to help Bwana and Kito escape the prison. Use the following detail maps to locate items in each location: the prison cell and the workplace. 1. Bunk bed: In the prison cell, have Bwana kicks the top bunk three times. Kito will fall down and breaks Bwana’s chain. 2. Ball and Chain: Grab the ball and chain next to the door. 3. Window: Hang the ball and chain on the window. 4. Wall: Tap on the ball and chain three times which will lift and bang it against the wall. The wall will break down. Exit the prison cell through the hole in the wall. 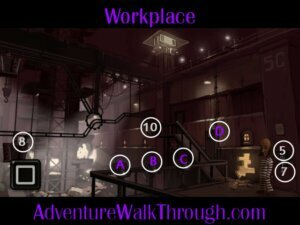 Enter a workplace. 5. Machine: The machine is off. Try flipping the power switch on the far right. Bwana needs something to prop the lever. 6. Skeleton: Go back to the prison cell. Grab the skeleton hand. 7. Lever: Return to the lever. Insert the skeleton hand. 8. Pickaxe: Notice a Pickaxe in one of the mining carts. Bwana needs to figure out the control buttons in order to retrieve the Pickaxe. 9. Mining Cart Puzzle: Notice three control buttons on the handrail and one control button on the wall next to the ramp. A. The left button moves the mining cart to the right or up. B. The middle button moves the cart downward. C. The right button moves the cart to the left. D: The wall button controls the mining track wheel. a. Tap on Button D once. b. Tap on Button A once. c. Tap on Button D twice. d. Tap on Button C once. e. Tap on Button D twice. f. Tap on Button B once. 10. Cart: Go up the ramp and retrieve the axe. 11. Chain: Use the pickaxe to break the chain and free Kito. 12. Grate: Break the sewerage grate with pickaxe. Climb down to the sewerage. Bwana and Kito have escaped!